Wavelength Division Multiplexing (WDM) is a technology which multiplexes a number of optical carrier signals onto a single optical fiber by using different wavelengths (i.e., colors) of laser light. This technique enables bidirectional communications over one strand of fiber, as well as multiplication of capacity. 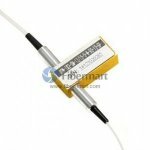 Fiber-Mart, backed by China factories, supplies a complete series of WDM Optical Network Solutions, such as multiplexers, splitters, amplifiers, attenuators, transceivers and other active or passive optical components.